The following is a list of questions that Aluminum Supply Company's staff frequently encounters. If you have a question and cannot find an adequate answer here, please contact ASCO via phone or email and your concern will be addressed in a timely manner. What are the differences between aluminum alloys? This is commercially pure aluminum (99% minimum). It has excellent corrosion resistance, weldability, and workability, as well as high thermal conductivity. This is the most commonly used commercial aluminum alloy. It is alloyed with a small percentage of manganese and has slightly higher strength than 1100. It is very workable and can be easily sheared and brake-formed. This alloy offers good corrosion resistance, but does not always provide the most consistent finish in anodized applications. This alloy is very similar in properties to 1100 and 3003, and is preferred where anodizing is required. All of ASCO's pre-finished anodized sheets are 5005-H34. It matches architectural alloy 6063 when anodized. This is one of the highest-strength common aluminum alloys. Any bends tighter than 90˚ may crack or craze on the corners. It offers very good corrosion resistance, and is our second choice (after 5005) for anodizing. Many other "common" (non-heat treatable) alloys are available with characteristics making them especially suitable for specific applications. Please inquire should you have such requirements. While limited in formability and workability, this alloy has high tensile strength – in the 30 to 63 KSI range. It is used in high-strength structural and aircraft applications. This is one of the strongest aluminum alloys. Formability is quite limited. Applications are similar to 2024 alloy, with 7075 chosen when higher mechanical properties are required. This is the most common structural alloy. It offers affordability, while maintaining strength and good corrosion resistance. It is commonly used in framing and structural applications where weldability and strength are important. Since it is harder in the T6/T651 condition than 3003 and 5005, it is not as formable; therefore, sheet may crack if brake-formed. ASCO stocks a wide variety of extrusions, sheets and plates in this alloy. This is an architectural alloy. It is highly resistant to corrosion and can be anodized with very good results. It is utilized in exterior and interior storefront, window, door, and trim applications. ASCO offers a wide variety of stock extrusions in this alloy in both mill and anodized finishes. How long does it typically take to obtain sheet or plate that is currently out of stock? Most standard sheet and plates sizes and thicknesses are readily available from ASCO stock. In the event of a stock shortage, standard sheet or plate can be obtained in 3-5 working days in most cases. Specialty sheet, or items that are cut to a non-standard size may take longer based on quantity and/or configuration. How long does it typically take to obtain extruded material that is currently out of stock? If stock shortages occur, most standard extrusions can be obtained directly from the mill within 3-4 weeks. ASCO rigorously monitors stock and tries to ensure that shortages occur minimally. If there is an urgent need to replenish stock, ASCO can obtain extrusions from other sources more quickly. Why aren't standard price lists available for your products? Costs of materials are subject to frequent changes due to fluctuations in the market, costs of raw materials, and other factors. These changes could affect selling prices. 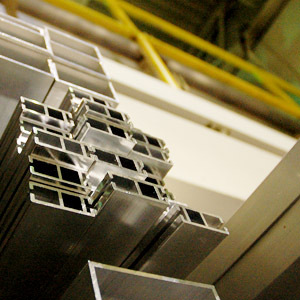 For sheets and extrusions, ASCO offers pricing based upon the requested quantity. For example, the cost for one or two pieces of a particular extrusion would be significantly different than the cost for 100 pieces of the same item. How can I order a custom extrusion die and what is the minimum amount of material typically required for a mill run? If your project requires extruded material that does not fit any currently available standard profile, custom dies can be built. It typically takes 1-2 weeks for the tooling to be manufactured. Extruding the custom shape generally takes 3-4 weeks. For most dies, there is a 1000-pound minimum. In some cases, such as those involving very large shapes, the minimum mill run may be 2000 pounds or more. For more specific information regarding custom dies, please contact ASCO's sales department via this site or by telephone (313-491-5040 or 800-899-2726). Can I stop in and browse your warehouse if I am unsure of exactly what I need? Due to company policy, ASCO cannot allow customers into the warehouse areas. To assist you in making your selections, we can offer the assistance of our experienced sales staff. At the service counter, samples of common sheet thicknesses and finishes are available for your reference. If an ASCO representative is available, we can also try to show you extruded products from the warehouse prior to purchase. What is anodizing and what are the benefits? Anodizing is a multi-step finishing process. The first stages include deep cleaning, rinsing, and chemical etching. Finally, a cathode is connected to a negative current source, and an aluminum part is connected to a positive current source, and both are placed in a conductive medium. When the electrical current is activated, the oxygen in the solution reacts with the aluminum part, causing aluminum oxide to be formed on the surface. This is basically single/one-step anodizing. Two-step anodizing adds color. Deposition of various metals into the anodized finish gives color to the finish, from the bronze range to black. Specialty finishers can even provide red, blue, green, or white anodized finishes. There are many benefits to an anodized finish. Not only does it offer greatly enhanced protection against corrosion, it also provides an increased resistance to normal wear and tear. Cleaning and maintenance is much easier with an anodized finish. Anodized surfaces are an excellent base for secondary coatings. I recently ordered some anodized material that does not match the same material with the same finish that I ordered previously. Why is that? There are many variables that may lead to color inconsistencies in anodized finishes. Any variation in alloy or temper of aluminum being finished can result in color variation. For example, an aluminum bar run at one mill may anodize differently than the same bar run at another mill due to only a very small difference in magnesium content. In addition, length of time spent in the anodizing "bath" can affect the final color. In the bronze range, for example, the longer the part is left in the bath, the darker the resultant color will be. Bronze colors are generally considered acceptable if they fall into an appropriate specified range. Our finishers are cognizant of these factors, and continually monitor their systems to maintain the best possible color consistency from batch-to-batch and order-to-order. For a premium, it is possible to obtain material that all comes from the same "lot," which means it was all produced in the same run. This is one way to improve the odds of a consistent finish throughout all of the material. What are rack marks/clamp marks and how will they affect my material? Clamp marks on fabricated materials are inherent in the post-anodizing process and are essentially unavoidable. In order to maintain the proper flow of current, material is typically clamped in from the ends. This will leave marks on both sides of the material, usually about the size of a nickel or dime. When anodizing pre-formed parts, it is often possible to specify which area is the least exposed after installation and clamp accordingly. Sheets are typically clamped in the two adjacent corners of the length of the sheet. Material that is not excessively heavy may be racked using a pin clamp, resulting in marks that are considerably smaller than those caused by a normal clamping situation. All pre-finished anodized sheet under .125" thick will have no exposed rack or clamp marks whatsoever. This is due to the fact that the material was anodized in coil form, rather than as individual sheets. Rack marks are also unavoidable on anodized extrusions, but on some shapes we can choose which surfaces are affected. What standard anodized finishes are readily available and how can I obtain a sample? Many of ASCO's sheets and extrusions are stocked in both clear and dark bronze anodized finishes. Sheet stock is available in a variety of other anodized finishes, including light bronze, medium bronze, and champagne. If your required finish is not available, ASCO can always have the material post-anodized. To obtain a sample of any anodized finish, please contact ASCO via this site or by telephone (313-491-5040 or 800-899-2726). I noticed that an extrusion in your catalog is listed as mill finish only but a similar size is available in all anodized finishes. Is it possible to obtain the size I need in an anodized finish as well? Most of the standard and popular extrusion and sheet sizes are available in both dark bronze and clear anodized. In the event that a particular size or shape is not available in the finish your job requires, ASCO can send the desired quantity out to be anodized. This process is a bit more time-intensive, averaging approximately 10-15 working days. What happens to welded material during the anodizing process? Why is it suggested that welded material is painted rather than anodized? Due to the inherent nature of the welding process, it is extremely difficult to obtain color consistency in welded areas when anodizing. The main issue lies in the differing alloys of the welding rod and the aluminum. With most standard applications, the difference in alloy will result in the weld anodizing as an inconsistent dark or dull silver-gray while the part itself would have a clean and uniform warm gray finish. This difference in color is extremely noticeable when the welds are exposed, and our customers generally deem this as unacceptable. There are some welding rod alloys that are supposed to accept the anodizing process, but past experience has shown that even these will still result in a non-uniform finish. In the rare case that a close color match is obtained, there is still one problem that is essentially unavoidable. The heat generated while welding changes the temper of the aluminum that has come in contact with the welding rod. After the material is anodized, a light gray or white halo will appear around the weld, resulting in additional inconsistencies and causing the weld to appear much larger than it actually is. In some cases, white fissures may also develop throughout the body of the weld itself. Grinding the weld further increases the inconsistency of the finish, as it often alters the grain of the material, which will be greatly exaggerated during the anodizing process. ASCO generally recommends that welded material is post-painted to match the required anodized finish. While it is a bit more costly, it eliminates most of the variables and allows much greater control over the finishing process. Ultimately, it will result in a completely uniform appearance. What is the typical lead time for anodizing material? All required post-anodizing is outsourced to experienced anodizing facilities. Lead time mostly depends on the size, shape, and quantity of the material. Typically, it takes 10-15 business days from the time the material leaves the ASCO facility to the time it will return. Please note that with orders requiring fabrication, the total lead time will be longer. What materials are available in a brushed or polished finish, and how can I obtain a sample? Our standard sheet stock items include #4 brushed (strong directional grain) and #8 polished (mirror finish) stainless steel. It is also possible to obtain brushed or polished aluminum and brass, but these are not standard stock items. To obtain a sample of our brushed or polished stainless steel or to check the	availability of other materials, please contact ASCO via this site or by telephone (313-491-5040 or 800-899-2726). How are the sheets protected from damage while handling? Can brushed and polished materials be used in fabrication without excess damage? All brushed and polished sheets are protected with a thin vinyl masking that is to be removed at the time of installation. This typically protects the finished surface from most scratching and gouging during the fabrication and handling processes. What problems arise when handling brushed aluminum? Brushed aluminum is extremely prone to wear and tear without further finishing after the brushing. The finish is very susceptible to oils commonly found on human skin, for example, causing fingerprints and other markings to be quite evident. Removing these marks is difficult and in some cases nearly impossible. On an exterior application, it is impossible to properly maintain the cleanliness and overall appearance of the brushed aluminum. ASCO typically recommends using a brushed stainless steel or clear anodized material as a substitute for brushed aluminum products. What is the typical lead time for brushing/polishing unfinished material? Depending on the quantity and size of parts requiring finishing, it can take approximately 10 to 25 working days to obtain the proper brushed or polished finish. What colors of paint are available and how can I obtain a sample? ASCO stocks Petersen Aluminum's PAC-CLAD® pre-finished steel and aluminum sheet. Please see our color chart (link to Petersen Color Chart) for available finishes and thicknesses. These colors are a very economical choice when seeking a painted finish. If your project requires a custom finish or another manufacturer's standard color, ASCO will outsource the finishing to an experienced local painter. Nearly any color imaginable can be matched. Material may be painted in sheet form, or to avoid the possibility of fabrication-related marring, after brake forming. If your project requires painted extruded material, it must be sent out for finishing. None of ASCO's extruded material is stocked in a painted finish. To obtain a sample of any of our pre-finished painted colors, please contact ASCO via this site or by telephone (313-491-5040 or 800-899-2726). What is the standard type of painted finish for interior and exterior architectural applications? The industry standard for high-performance painted finishes is a 70% fluoropolymer, also known as Kynar 500® or Hylar 5000®. This class of finish is easy to maintain and is extremely resistant to wear and fading. All Kynar 500® and Hylar 5000® finishes meet or exceed the standards outlined in the AAMA 2605 specification. This type of finish is acceptable in both interior and exterior applications. For interior applications, a more economical 50% fluoropolymer or baked enamel is available. These finishes do not perform to the level of the 70% fluoropolymer and are not recommended for exterior architectural applications. All pre-finished PAC-CLAD® painted sheet stocked at ASCO utilizes the 70% Kynar 500® and Hylar 5000® finishes. Typically, all post-coated painted material is finished with a 70% fluoropolymer unless otherwise specified. My project specifications require matching a manufacturer's standard color or a custom color as selected by the architect. Will this pose any problems? If your project requires a custom finish or another manufacturer's standard color, ASCO will outsource the finishing to an experienced local painter. When utilizing a custom color, a sample paint chip must be supplied to ensure an accurate match. If the color is a standard of another paint or product manufacturer, the paint color code can often be used to obtain a sample of the finish. When requesting a quote for custom painted material, please provide as much information regarding the finish as possible. What are the minimum material thickness requirements for post-painting? Will there be any visible rack marks, such as those inherent to anodizing? The standard minimum material thickness for custom painting is .040. After a part runs through the paint line, it is then run through an oven in order to cure and set the paint. If thinner material than .040 is used, it is very likely to twist, warp, or otherwise deform during the baking process. This sometimes occurs with .040 material as well. ASCO suggests using a minimum of .050 when painting pre-formed aluminum. For painting flat sheets, 5052 or 5005 alloy aluminum is recommended if material is to be fabricated after finishing. When specifying a custom paint, it is vital that a non-exposed surface is clearly identified. There must be some area on the part that can be placed on a wire rack or have holes placed in it to hang from the paint line. When painting pre-formed material, it will be racked on the non-exposed side. In some cases, holes must be drilled in the non-exposed area to allow for hanging. The customer must specify the locations that are acceptable for these marks. Similar to anodizing, flat sheet will have two holes drilled in the corners to allow for hanging on the paint line. This is essentially unavoidable when painting flat sheet. Is it more efficient and economical to custom paint material in sheet form or after all fabrication is complete? ASCO has approached fabrication jobs in both fashions. For a multitude of reasons, it is typically recommended that material is painted after all fabrication is completed. Cracking and crazing on the corners is somewhat common to bending aluminum of heavier gauges. While fluropolymer finishes do have elastic characteristics, paint on the corner of thicker material may have noticeable crazing. Painting after fabrication helps to mask a bit of the crazing on the corners of the product. It also ensures that the paint will not crack or chip. ASCO has continually obtained much more favorable results when finishing after fabrication. Is it possible to obtain painted material that is finished on all sides? A majority of our standard pre-finished material is finished on one side only. There are a few items, including white baked enamel and dark bronze/black painted, that are finished on both sides. On these items, masking is typically available on one side only. The cut edges of the material will be unfinished. With custom painted orders, it is possible to get close to full coverage in some cases. This is considerably more costly and labor intensive. No matter what, the painter will have to rack the material somehow. It is critical that an exact location for racking holes/rack marks is provided in order to ensure accuracy. On all architectural metals, there is typically some point on the part that will need to be fastened to something else, resulting in a condition in which some of the material is not exposed. These locations must be specified in order to provide some sort of anchoring point for the paint line. 100% full coverage on all exposed faces and edges of a part without rack marks or holes is essentially impossible to obtain. What is the typical lead time for custom painted material? Depending on the painter's schedule and the size, quantity, and shape of the material, it can take from 5-10 days for finishing. In cases where there is an excessive amount of material or extremely large finished surfaces, it may take 10-15 days for painting. It is very helpful to get as much advanced notice as possible when ordering custom painted material, as paint often has to be ordered from various locations throughout the country. Can you recommend a specific material/thickness based upon my job requirements? An ASCO representative can suggest material options based upon your application and previous experience with similar situations. In the event that a suggestion does not produce favorable results, ASCO cannot be held responsible. All advice is given at the request of the buyer and accepted at the buyer's risk. Please refer to our Terms and Conditions for more information regarding technical advice. What are your standard tolerances for shearing and bending? The standard tolerance for shearing applications is 1/32". For typical brake forming applications, the standard tolerance is 1/64". What is the thinnest and thickest material that can be bent? If you would like more information regarding fabrication capabilities, please see our Machinery Information area or please contact ASCO via this site or by telephone (313-491-5040 or 800-899-2726) to speak with a representative. What is the thinnest and thickest material that can be sheared? If you would like more information regarding fabrication capabilities, please see our Machinery Information area or	please contact ASCO via this site or by telephone (313-491-5040 or 800-899-2726) to speak with a representative. What is the smallest leg that can be bent? The size of the smallest bend depends mostly on the thickness of material and the bending conditions. The following table illustrates the smallest leg that can be bent in a typical 90˚ situation using 3003 H14 alloy aluminum. What materials are you capable of welding? Any pre-finished anodized, painted, or brushed material should not be welded. The welding process will cause excessive damage to the finish. ASCO's fabrication staff is primarily experienced in the welding of aluminum. Typically, the welding of other materials, such as stainless steel, is not done in-house. For more specific information regarding our welding capabilities,	please please contact ASCO via this site or by telephone (313-491-5040 or 800-899-2726) to speak with a fabrication representative. What happens to thick or hard alloy aluminum when it is bent? None of the strong or structural alloys can be brake formed unless they are in either the O or the T-4 temper. The common T-6 temper is quite hard, and when bent even minimally may crack. Thinner material in the 5000 series alloys can be bent with relative ease. In	most applications, thicker material of the 5052 H32 alloy cannot be formed	at an angle tighter than 90.˚ After reaching 90˚, severe crazing and cracking will occur on the bent corner. If the material is subjected to further stress while bending, it often breaks entirely. ASCO has had the most success bending 3003 H14 and 5005 H34 aluminum. These alloys are recommended for the majority of fabrication applications, as they are extremely workable. They can easily be cut, bent, and welded, and typically achieve the most favorable results. How will bending affect the anodized or painted finish on a material? When thinner material is pre-finished, bending generally has little effect. Any slight crazing at the corner is generally imperceptible. Other than a few standard anodized colors, thicker material (.090+) is not available in pre-finished anodized or paint. In most cases, thicker material needs to be post-anodized or painted, which can help slightly reduce the appearance of crazing along the corners. I have a very large fabrication job with a very tight schedule. Is ASCO equipped to handle large, complex jobs? ASCO is experienced in handling fabrication jobs of any size, ranging from architectural panels to coping and gutter systems. Our years of experience allow us to fabricate your products quickly and accurately. For extremely demanding schedules, ASCO relies on a reliable network of industry resources to assist in the fabrication process. It is recommended that all material required is thoroughly reviewed by our fabrication staff prior to issuing an accurate lead time. Please send all available drawings and supplementary information to ASCO via fax or the contact form on	this site, and a fabrication representative will respond as soon as possible. What is the approximate lead time for the typical fabrication order? If the required material is in stock, the typical lead time is 3-5 working days on most fabrication orders. This is entirely dependant on the current work load, so please contact ASCO via telephone (313-491-5040 or 800-899-2726) to obtain accurate lead time information. Fabrication representativesare available in the office Monday through Friday from 8 AM until 4:00 PM. Do you have industry-accepted standards for various types of common architectural products? ASCO fabricates Factory Mutual approved coping, fascia, and gravel stops. We also have standard configurations for gutters, downspouts, scuppers, reglets, standing seam roofing, and more. The ASCO staff is experienced in designing and fabricating many architectural products ranging anywhere from exterior wall panels to thru-wall flashings. Most material is fabricated to the customer's exact specifications. All finished dimensions must be supplied or approved by the customer prior to fabrication. If you are interested in any of our products, please contact ASCO via this site or by telephone (313-491-5040 or 800-899-2726) for more information. What does ASCO do to ensure the material is accurately fabricated? At ASCO, our pride is in our product. We take every measure to ensure all parts are fabricated quickly and accurately. All dimensions are checked and verified to minimize errors, and most issues are corrected before the material ever leaves our facility. In the event that ASCO fabricates something incorrectly, we will investigate the situation and replace the parts at no charge if it was our mistake. I encountered a unique and troublesome situation in the field and I am unsure what would be required to remedy the issue. How can ASCO help? ASCO can send an experienced member of our fabrication team out for an on-site consultation. We can help guide you through the fabrication process and offer some recommendations based upon your existing conditions. To ensure accuracy, cost estimates and lead times will be established by the same representative that was present at the job site. Drawings of the existing conditions and ASCO's potential solution will be provided for approval prior to fabrication. If you are interested in setting up an on-site consultation, please contact ASCO. Please refer to our Terms and Conditions for information regarding technical advice.